So Sibohan as made her debut in the Supergirl TV show, and I am enjoying the character but with Supergirl's return to the mainstream DCU on the horizon I do hope we see more of the New 52 version, as I quite like her. Reposted from December 2014; here are some scans on how she met Supergirl. With Issue #2 recently out, I can now recap the first issue of this grand crossover. In honor of John 'Q' De Lancie's birthday this past week, I present to you the final 2 parts of The Q Gambit, Previously, Sisko, Kirk, Uhura and Scotty were saved by the Defiant from Earth where the Changelings have just assassinated Chancelor Worf in a secret invasion. Meanwhile Spock and McCoy along with Kira Nerys have been captured and brought back to Terok Nor along with a Bajorian artifact believed to be holding the last of the Prophets...which Gul Dukat shatters. Okay I don't want to ruin anyone's buzz, so feel free to skip this post if it's going to bring you down. 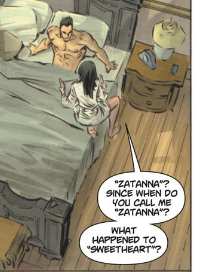 I really like the Zatanna/Bruce dynamic, and it doesn't get enough love, so here's a very bittersweet moment. Bruce and Clark were trapped in a dream world by Doctor Destiny, and they've finally broken free to reality. HAPPY NEW YEAR! I decided to wait till after the 31 days of Scans was over to post scans of Part 3 of The Q Gambit. To recap, Q transported the Enterprise to the future of their timeline where they meet Benjamin Sisko and the rest of the Deep Space Nine crew, however history has changed and The Dominion have taken over, the Federation has been defeated, Sisko takes Kirk, Uhura, and Scotty to Earth where it's now under the rule of the Klingon Empire. When last we left our heroes, Q introduced himself to Kirk and the Enterprise and then took them to the future and dropped them off in front of Deep Space 9!!! Which was now occupied by The Dominion! IDW's Star Trek title has been hit and miss with storylines so far, but they're setting up something pretty cool starting with this month's issue. It was only a matter of time before they bring 'Q' to the center stage. Picard is mourning Spock, when Q appears and informs him of Spock's situation (Alive in the past of an alternate universe. ), he then reveals a few details on the differences of the parallel timelines, then foreshadows the events caused by Spock's crossover will put the new timeline in jeopardy of a certain doom. Picard pleads with Q not to interfere, BUT we all know, Q can't resist toying with a new Starfleet captain.